This DJI Osmo Pocket Gimbal with Expansion Kit put together by B&H includes an Osmo Pocket gimbal, wireless module, controller wheel, accessory mount, and a 32GB microSD card. The Osmo Pocket is a compact, handheld 3-axis gimbal stabilizer with a 1/2.3" sensor camera that records up to 4K60 video and takes 12MP stills. The wireless module allows you to connect your smartphone via Wi-Fi for gimbal and camera control. The mount can be used to add accessories to the gimbal, and the controller wheel provides fine pan and tilt control. A 32GB microSDHC card is also included. The Controller Wheel attaches right below the LCD of the gimbal, facing the user, and provides a dial for precise pan and tilt control. The dial is comfortably accessible by thumb. A selector switch next to the dial allows you to choose whether the dial should control pan or tilt motion. There's also a button for changing shooting modes and another button for re-centering the gimbal. The Wireless Module allows for remote control of the gimbal from your mobile device. It does this by providing a wireless connection between the two over Bluetooth and Wi-Fi while serving as a base. It can also be used just as a base. And it offers a USB-C connector for charging the gimbal. The Accessory Mount provides a 2-prong mount for attaching 3-prong accessories on the front of the gimbal. It clasps on around the center of the gimbal. A Samsung 32GB microSD card is also included in the kit. Provides a pan and tilt thumb dial, mode select button, and gimbal re-center button. Allows for remote control of the gimbal from your mobile device by providing a wireless connection between the two. It can also be used simply as a base, and it offers a USB-C connector for charging the gimbal. Provides a 2-prong mount for attaching 3-prong accessories on the front of the gimbal. It clasps on around the center of the gimbal. Box Dimensions (LxWxH) 6.0 x 3.8 x 2.8"
This kit consists of two components that are packaged together. The Osmo Pocket Gimbal and the DJI Osmo Pocket Expansion Kit. 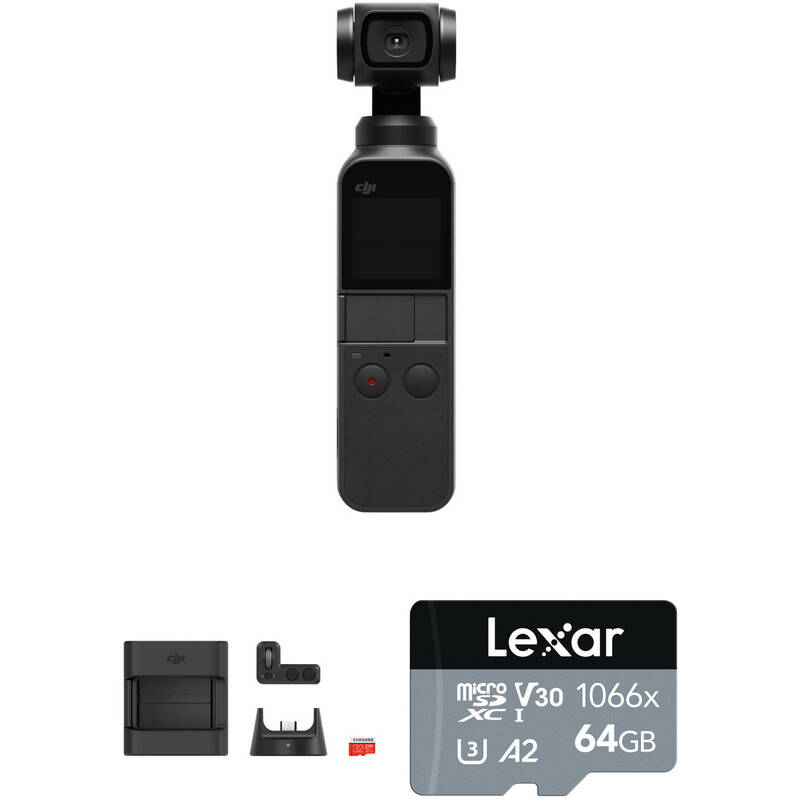 Within the DJI Osmo Expansion kit comes a 32GB microSD card. Currently when purchasing B&amp;H # DJOPEXK (B&amp;H Kit), a 64GB microSD card is included as well for free. What is the Controller Wheel is used for? The Controller Wheel is used for a more precise pan and tilt control. The controller also helps in changing shooting modes and for re-centering the gimbal. Can the DJI Osmo Pocket live stream to facebook? It can not live stream to Facebook. Does the osmo have a time laps mode and if so what can it be set to?